Sorry I haven't written in a long time. It was a busy week. Tuesday: arrived in Shanghai in the afternoon. I met up with Maja for dinner. We had soup dumplings... my favorite! I could eat them every day! Wednesday: I worked out of the Shanghai office. A small group of us went to lunch and everyone in that office was really nice! I ended the day with a 90 minute massage and then met Maja for a quick bite to eat. Thursday: I left the hotel at 5:40am to head to Nanjing to photograph Nanjing University economics and finance building. We took the high speed train and it only took an hour and 20 min to get there. It would have been 3.5 hours in a car. I thought it would be an easy day but we didn't sit down or take a break until 5pm! We had a quick dinner in which my colleague over ordered food. So so much food! Then ran back to the site for a dusk shot. We caught the 8:40 train back and I got to the hotel around 10:45. Long day! But in the end I think we got some good shots. This is at the end of the meal. She ordered 8 different dishes! The yellow one came as we were paying the bill. She had forgotten she ordered it! Friday: I was back in the office again. It was nice to have time to sort through the shots from Hanoi and Nanjing and plan upcoming shoots all over the states. Maja and I did our normal thing... we worked late. Mark commented that we have that in common. We then headed out to a nice dinner at a Thai restaurant. It was so good and we only slightly over ordered. 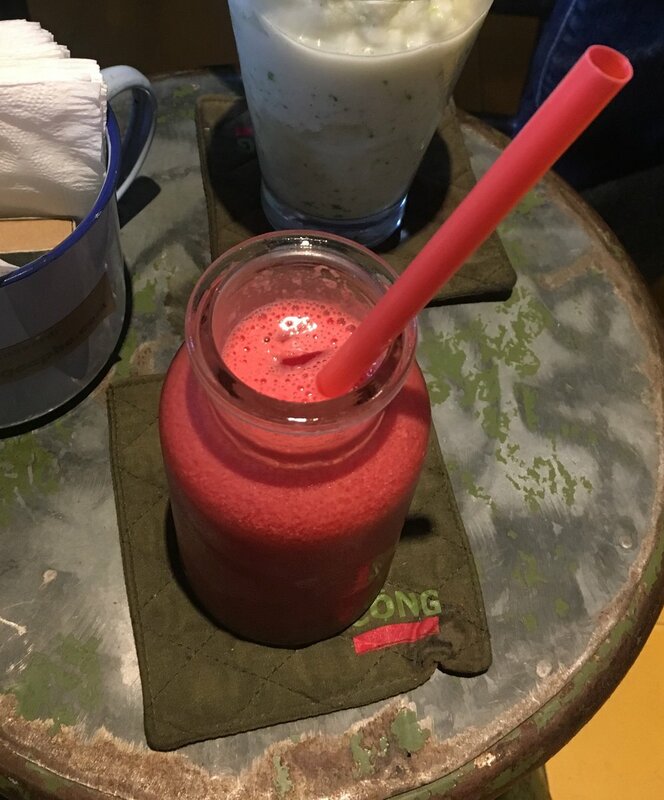 I got a chance to have another watermelon juice. This is becoming a new favorite! I just arrived in Shanghai. This morning we finally got great shots of the east side of the school we were photographing. I took 8 shots in an hour... that is a LOT for architectural shots. I just checked into the hotel. I am headed next door to the office now to meet up with Maja and hopefully convince her to leave the office for dinner! Sorry these aren't exciting posts. Not much is exciting right now! Tomorrow will be a boring post because I will just be working from our Shanghai office for the day. Just a short post because it was a very long day working and then I immediately went to a performance. I just got back to the hotel (8pm) and have to pack and leave at 6am. We are going back to the site for a third time to try to get sun on the east side of the building if possible (it hasn't been the two days we have been on site). Then off to the airport by 8:30am! We fly to Shanghai and I will be there til Sunday night or Monday morning. I am looking forward to it because my friend Maja lives there! This was the performance that I went to tonight. It was acrobatics, percussion and some singing. It was a beautiful show. I walked in and immediately saw the librarian from the school I photographed today! We spent the whole day exploring and people watching. I am exhausted so I will let the photos speak for themselves. Where we sat for 30 min eating Pho for lunch. Where we sat for an hour people watching and eating raspberry ice cream. Where we sat for 30 min looking at photos we took throughout the day and drinking watermelon juice. I came to Hanoi two days early to take a two day vacation before my shoot on Monday. While we were having breakfast and commenting on the fact the sun was out (it was supposed to rain the whole time we were here) we decided we should go to the site and take some photos to be safe. We left the site at 6pm. So much for a vacation day! It was 90 degrees and about 110% humidity and we were outside all day! I was thrilled to get back to the hotel for a quick shower before meeting a client for dinner. We hit a little traffic on the way to work! Here is the school I photographed today. A nice building almost makes it worth missing a vacation day... almost. I took out $1,500,000vnd from the ATM! Never thought I would be a multi millionaire! Tomorrow I will do a walking tour of Hanoi. Fingers crossed that the jet lag doesn't set in! This hotel is quite nice! Grandmother and Pop asked if I had to swim or boat to my room so here is a visual of the hotel. I am off to breakfast! I have no connection to the internet all day, so I will post again tonight. I arrived safely! I am going to try to get some sleep laying down instead of sitting up in an airplane seat. The next two days are vacation days. I am meeting a colleague in the morning for breakfast and he will show me around Hanoi. It is midnight here, so I can't take a good picture of the nice hotel I am in. It is on the water, literally ON the water. I will take a daytime photo tomorrow. I am sitting in the Tokyo airport and remembering one of my favorite videos. Jess and Anja sent me a video while I was traveling for 3 weeks in China 3 years ago. I was homesick and it was nice to see their faces and know they were thinking of me! I am posting the trip to Vietnam and China to be able to keep everyone updated when I have limited connection to email, texting and social media. My travel time door to door is estimated at 29 hours. I left my house at 8am Thursday morning and arrive at my hotel at midnight Friday Hanoi Time (1pm Friday afternoon in NY). 14 hour flight to Tokyo, a 4.5 hour layover, followed by a 6.5 hour flight to Hanoi. As I post this I am 12 hours in and somewhere near the International Date Line between Alaska and Russia! This is a photo of the Hudson Bay in Canada. Absolutely beautiful views (until they made me shut the shade so people could sleep).